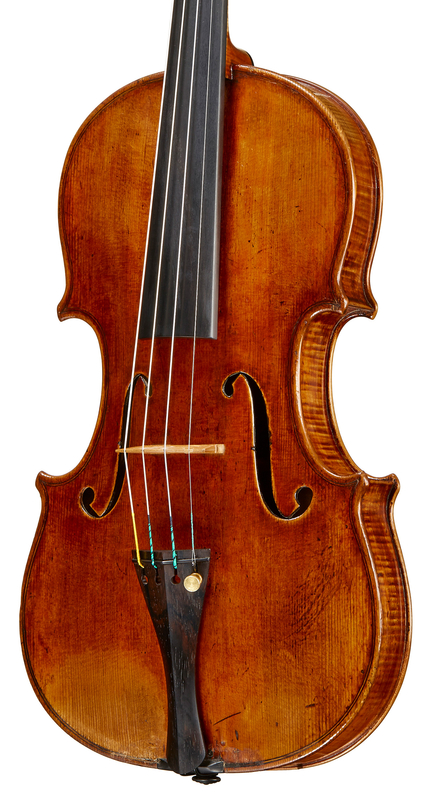 This violin, chosen by Dorothy DeLay (then Dorothy Newhouse) from Rembert Wurlitzer Inc. in 1969, is a strong example of the late Turin Guadagninis that are so highly prized. It is typical of the period, with a low, flat arch emphasized by wide edges, broad corners and thick red varnish. These features were Guadagnini’s response to encouragement from his former patron, Count Cozio, to work in the style of Stradivari. Yet, typically for Guadagnini, the effort is taken to an extreme, which establishes a separate aesthetic altogether – one sought by players for its tone and by connoisseurs for its originality. Dorothy DeLay (1917–2002) was one of the most successful yet unconventional violin teachers of the century. A list of her pupils reads like a Who’s Who of violin playing – among them Itzhak Perlman, Midori, Nigel Kennedy, Sarah Chang, Gil Shaham and Kyung-Wha Chung, as well as the leaders of quartets such as the Juilliard and Takács. Her masterclasses were world famous and young violinists flocked to the Aspen Music School each summer for a chance to study with her. The secret to DeLay’s success, she said, was to tailor her advice to each individual student, rather than keeping a rigid method. Her approach was informal, nurturing and motherly, and lessons could cover what best to wear for a competition or concert debut, or even relationship advice, alongside violin technique. She was famous for addressing her students with endearments such as ‘sugarplum’ or ‘sweetheart’ – and notorious for her unpunctuality, although she was also happy to teach until well past midnight. DeLay’s relationship with her pupils was enduring, and many would return long after completing their studies. DeLay was born in Kansas and learnt the violin from the age of four. She showed great early promise and studied at Oberlin, Michigan State University and later with Ivan Galamian at the Juilliard School. At first she performed as a soloist and chamber musician, founding the Stuyvesant Trio in 1939, but her instinctive gift for teaching was revealed when in 1948 Galamian invited her to become his assistant. The pair taught together for over 20 years. DeLay became a leading teacher in her own right and received many honors, including the National Medal of the Arts from President Clinton in 1994 and the Artist–Teacher Award from the American String Teachers Association. At a memorial service held by the Juilliard School after her death, her students packed the stage for a performance of the Bach ‘Double’ Violin Concerto conducted by Perlman, who now holds his former teacher’s position. The ‘DeLay’ Guadagnini was sold by Tarisio in 2013.